How A Shorter Sea Ice Season Is Changing Life In The Arctic Climate change is so dramatic in northern Alaska that the effects on hunting and erosion are very real to people who've lived their whole lives there. Iñupiaq hunter Billy Adams says that even though the ice is changing, hunters are finding ways to adapt, like waiting for ringed seals to come close to the shore and hunting them from the beach. People who live in the town of Utqiaġvik have seen dramatic effects of climate change during their lifetimes. Utqiaġvik, formerly known as Barrow, sits right on the edge of the Arctic Ocean at the very top of Alaska. It's the northernmost town in the United States, and home to about 4,400. The coastline here used to be edged with sea ice for nearly the whole year. But that period is getting shorter and shorter, and as a result Utqiaġvik locals are dealing with coastal erosion and are changing how they hunt in the fall. Billy Adams is an Iñupiaq hunter in his 50s who's lived in Utqiaġvik his whole life. He grew up hunting ringed seals in the fall by going out onto ice attached to the coastline. "We would have [ice formed] by...October, mid-October. Somewhere around there," says Adams. Iñupiat hunters eat ringed seal meat, use the skin for clothing and the oil to build hand-made boats. They can only hunt on the ice when it's thick and stable enough to support their weight. But this year in October, instead of ice there were waves crashing on shore. Now in December, ice has been forming in fits and starts for about a month. Rick Thoman is a climatologist for the Alaska Center for Climate Assessment and Policy at the University of Alaska Fairbanks. He says Utqiaġvik is warming, along with the rest of the Arctic, about twice as fast as the rest of the globe. If you want to see some of the most dramatic change on the ground, the Utqiaġvik coastline in the fall is a good place to look. "If you get in your time machine and go back to 1965, or 1940, or 1900, and you're on the beach at Utqiaġvik, in the autumn you're looking out at a white sea," says Thoman. Back then, pieces from the big mass of ice that was able to remain frozen all summer on the Arctic Ocean would start getting blown to shore in the fall. That would cool things down, and help to form even more ice along the coastline. "That's all changed now," says Thoman. That mass of ice has shrunk so that it's now hundreds of miles offshore in the fall — too far to be blown in. "So we've moved into a situation now where we have to 'make our own ice' so to speak," Thoman says. In other words, the ice has to form in place along the coast without the help of that other ice, which takes more time. Waves crash on the shore of Utqiaġvik in late October. 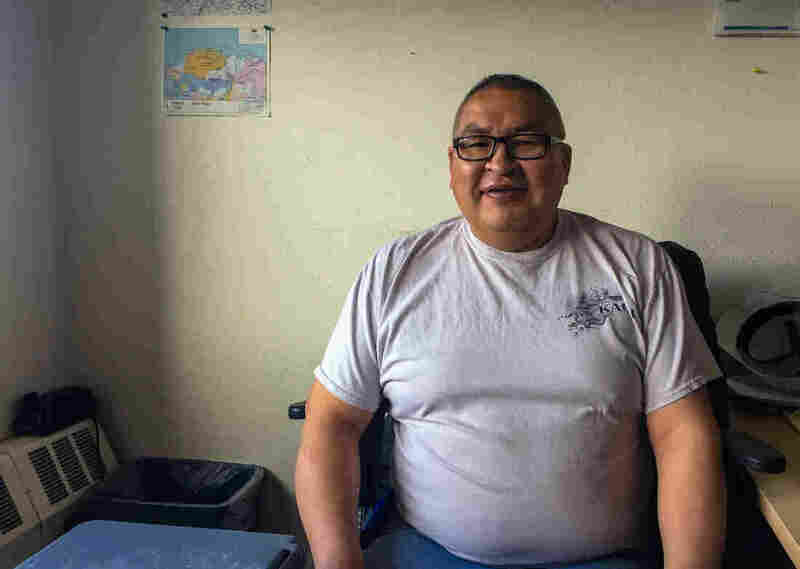 Billy Adams, who has lived in the Arctic town his whole life, says that when he was growing up, by October there was almost always enough ice attached to shore that he could go hunting ringed seals on it. 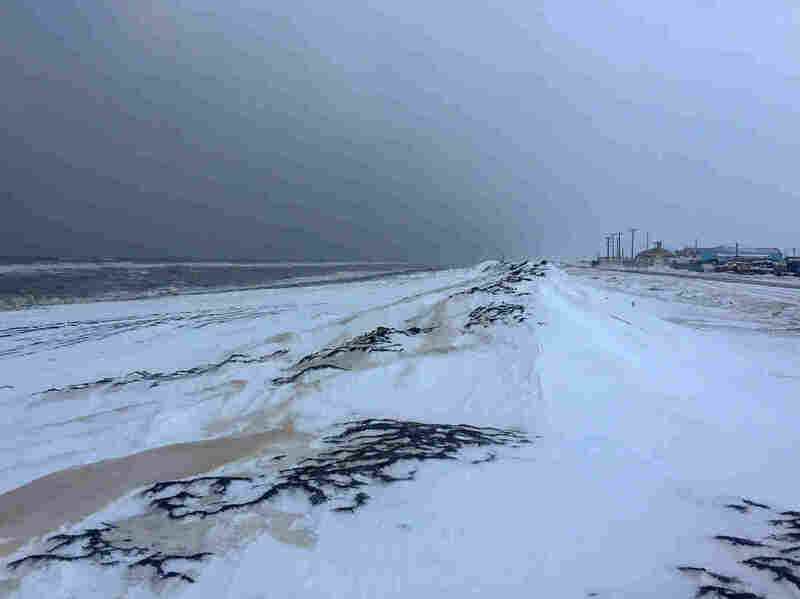 One big problem that Utqiaġvik is facing as a result is increased coastal erosion. Declining sea ice allows for higher waves during storms and leaves the shoreline unprotected for more of the year. Local officials are concerned about future storm damage to roads, the town's drinking water, and a decommissioned military landfill site near the beach. Billy Adams says that for him, the ice is also personal. It serves as a place to pray, gather his thoughts, and heal. When asked if he's concerned that future generations won't get that, he says that he's not going to worry about it right now. "That's not in my thoughts right now," he says. "They're going to do fine. You know, we have to be positive." Adams says hunters are adapting to the change, for example, by waiting for ringed seals to come close to the shore and hunting them from the beach. Researchers expect the Arctic to keep warming, and the ice season here to get shorter and shorter in the years to come.